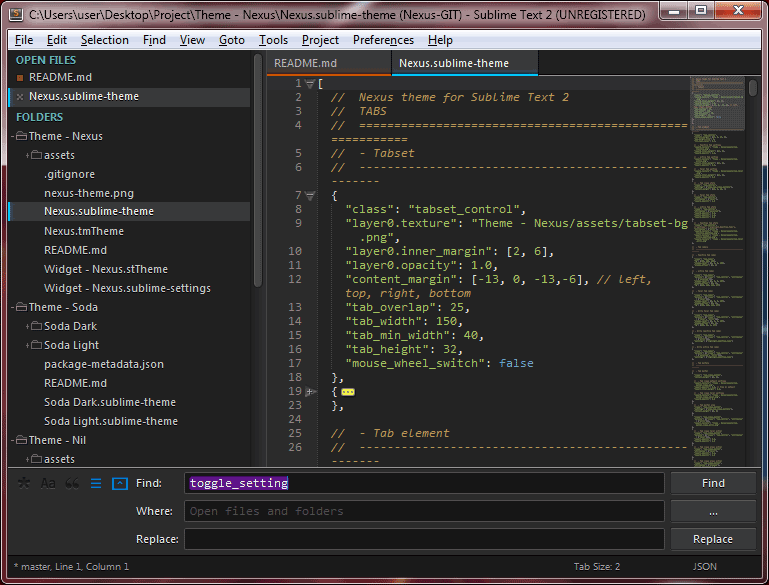 Dark custom UI theme for Sublime Text 2/3. ST3 updates provided by Raynos and LOQUILLO! doesn't do it for you (and it's rough around the edges, so it may not). If you are using Will Bond's excellent Sublime Package Control, you can easily install Nexus Theme via the Package Control: Install Package menu item. The Nexus Theme package is listed as Theme - Nexus in the packages list. Alternatively, if you are a git user, you can install the theme and keep up to date by cloning the repo directly into your Packages directory in the Sublime Text 2/3 application settings area. git clone https://github.com/EleazarCrusader/nexus-theme/ "Theme - Nexus"
Add (or update) your theme entry to be "theme": "Nexus.sublime-theme"
To use it simply select your Preferences -> Color Scheme -> Theme - Nexus -> Nexus.